Since missing more than two months to injury, it seems freshman Chris McMahon is finding his rhythm. 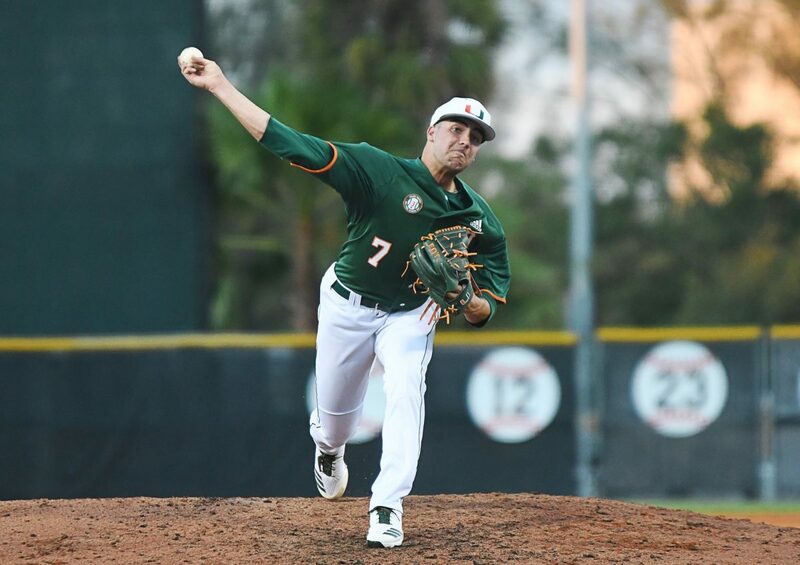 After pitching a shutout 4 2/3 innings in his first collegiate start, the right-hander was on fire Wednesday, April 18, putting forth his best performance so far as a Miami Hurricane. He struck out a career-high eight batters and gave up just one run in eight innings. His performance led UM to a 8-1 victory over the Florida Gulf Coast Eagles Wednesday evening at Mark Light Field. McMahon (1-0), who was the No. 76-ranked MLB Draft prospect by Baseball America last spring, tore the meniscus in his right knee mid-January and didn’t return until March 29. The West Chester, Pennsylvania, native has been on a pitch count since his return, but made it all the way up to 89 pitches on Wednesday evening. He scattered two hits, gave up no walks and retired 18 of the final 19 batters he faced, including the final 12. The season series between Miami (16-20) and FGCU (25-10) is now tied at 1-1 with the final meeting coming May 9. The first game resulted in a 1-0 Hurricanes loss in a pitcher’s duel. The Canes got off to a hot start early, scoring four runs in the first two innings, driving out eagles starting pitcher Peyton Gray, who lasted just 1 1/3 innings while allowing three hits and two walks. Leading 5-1, Miami secured the victory with three runs in the eighth inning. Freshmen Gabe Rivera and Freddy Zamora led the way for UM going 3-for-4 and 3-for-5, respectively, and combining for two RBIs. Zamora has recorded 14 multi-hit games this season, which leads the team. Freshman second baseman Willy Escala missed his first game of the season after starting the first 35. He was one of three Hurricanes to start the entire season thus far – Zamora and redshirt senior Michael Burns are the other two. Miami has now won three of its last four games, including two against No. 8 Clemson, and looks ahead to a weekend series against Pittsburgh starting at 7 p.m. Friday, April 20, at Mark Light Field.